Home > English Grammar > English Language: What is Parenthesis? You may have already been using parenthesis within a sentence without even knowing it. The parentheses (commas, brackets and dashes) are probably the most commonly used English grammar technique. Where parenthesis is concerned, it is completely your choice whether to use dashes, brackets or commas. You may find it easier to use one type of parenthesis within your writing, and only use another when you have to. Once you feel comfortable with one type of parentheses, you can always start practising with another. Follow the guidelines below to find out which parentheses you should use within English text. Commas – When using commas to separate parenthesis within a sentence they may get confused with the other ‘normal’ commas. However, the plus side for using commas with the parenthesis is that it will flow like a normal sentence. Dashes – Using dashes with the parenthesis makes it more obvious that it is extra information, which technically, makes it appear separate from the original sentence. Brackets – Again, using brackets makes the parenthesis easily visible to the reader. However, using brackets can sometimes make the text appear unorganised. Isabelle’s favourite toy - the wind up dog – is broken. During a midnight raid, which took place at the soft toy factory, a man was shot. 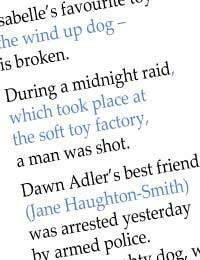 Dawn Adler’s best friend (Jane Haughton-Smith) was arrested yesterday by armed police. The naughty dog, which chewed my shoes, is now living outside in a kennel. The bread, which I bought from the supermarket, has already gone stale. Sometimes, when using parenthesis in a sentence, writers often forget to actually end the parenthesis. When you use a parenthesis in a sentence, think of it as using brackets; you wouldn’t leave brackets open, so remember not to leave a parenthesis open either. Leaving a parenthesis open can cause confusion within the sentence, which makes it difficult for the reader to understand the original meaning. All of the following words and phrases are classed as parenthesis within a sentence; however, they are not normally used with brackets or dashes, and are more likely to be used with commas. Parenthesis is very common in the English language; using parenthesis and parentheses helps add more information to a statement without stopping the flow of the reading or writing. The easiest way to see if you have added a parenthesis into a sentence is to see if the sentence can survive without the added information.